You'll have fun even if a little, golden stag doesn't dance on your hand. You swore you wouldn’t do it again and yet, here you are. You raise your bleary, post-Xmas head in which visions of sugar plums — whatever the heck they are — have polka’ed your plan-ahead gene into oblivion. You realize — horrors! — it’s mere days until New Year’s Eve and you’ve forgotten to figure out where you’ll go for the Most-Fun-Or-Die-Trying Night of the Year. Not to worry, slackers. Ms. Go Go has sifted through this year’s list of umpteen parties and chosen three of the best. The fun patrol never sleeps. Maybe it’s the influence of HBO’s Boardwalk Empire. Maybe party planners are feeling especially simpatico with the Great Depression. Maybe it’s just the appeal of the sleek duds. Whatever the reason, it seems every other New Year’s Eve event this year is a Prohibition-era shindig. There could be worse problems. 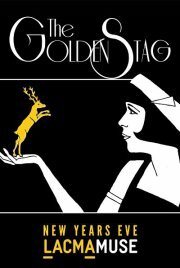 If a Roaring Twenties New Year’s Eve is your cup of bathtub gin, ankle over to the posh Park Plaza for LACMA Muse‘s Golden Stag New Year’s Eve Party . Dressed-to-impress sheiks and shebas — that would be you, fashion plate — will be sipping cocktails, savoring treats, ogling dancers, prancers, and romancers, and swinging to the eighteen-piece Elliot Deutsch Big Band. The swanky, revelry-revved bash is a Sypher Art Studios affair — you know them from Labyrinth of Jared Masquerade Ball — so top drawer talent, peerless ambiance, and impeccable attention to detail are all guaranteed — not to mention a complimentary champagne toast and midnight fireworks. The latter can’t hold a sparkler to you, Broadway baby. That ball drop signifying the end of the year? Yawn. So unoriginal. This year, up the countdown ante with a midnight toast to oblivion — the Mayan, not the liquid Manhattan kind — at The Beginning of the End of the World New Year’s Eve Party at Villain’s Tavern. To help you prepare for the possible arrival of the Four Horsemen of the Apocalypse — those party poopers — the Arts District oasis offers Punchfest; on New Year’s Eve, five to seven varieties of VT’s signature punches will drop a dollar an hour in price from $11 for a Mason jar pint at 7:00 p.m. to $6 at midnight when you’ll also get free champagne to toast the End of Days. The Rapture is so much more palatable with punch and a little bubbly. See how good Marilyn looks in black & white? Just in case the world is ending next December, you’ll want to rack up some good karma to offset the impending cataclysm. 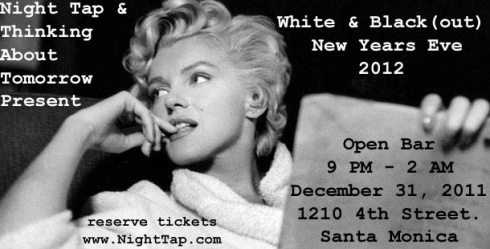 This New Year’s Eve, do good and look good doing it at the White & Black(out) Ball, presented by Night Tap and benefiting Thinking About Tomorrow — a Santa Monica–based org that initiates community educational programs such as health and fitness initiatives, recycling programs, and back-to-school drives. Already, you’re feeling so much better about your post-Apocalyptic prospects. You’ll keep that do-gooder glow well in into 2012 after the benefit bash in the two-story ballroom in the elegantly historical Santa Monica Bay Club (c. 1914). 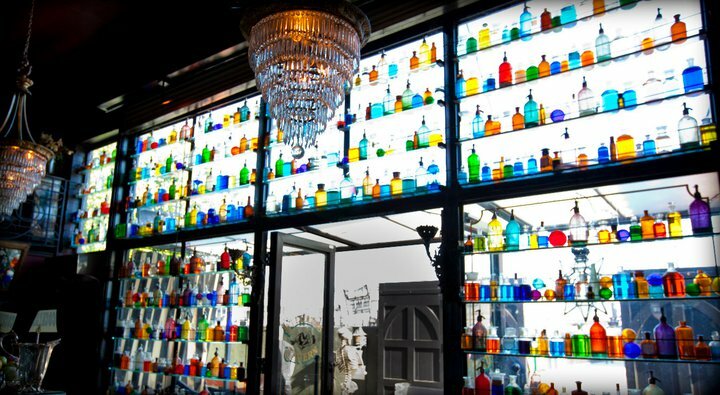 Everyone looks swell in black and white — as any pre-Technicolor movie proves — so join your fellow Beautiful Benefactors at the swell soiree featuring an open bar, music courtesy of Keaton James, the Rockstars, and DJ Jamie Charles, the ubiquitous champers toast at midnight, and giveaways all night long. It’s so easy being good. Go Go’ers, this NYE leave your 2011 cares behind you and the driving to the MTA, which is offering 24 hour service from 9:00 pm on Saturday, December 31st to “close of service on January 2nd”. Even better, the MTA is offering FREE rides on all Metro trains and buses on New Year’s Eve from 9:00 p.m. Saturday, December 31st until 2:00 a.m. on Sunday, January 1st. You can still ride after 2:00 a.m. — you just have to pay regular fare. For more details — including getting up at an ungodly hour for Rose Bowl Parade action — go to the Metro website. Next Post On The 12th Night of Xmas…. Stop with your exciting life all ready! You’re making me cry. Clearly, you need to drown your sorrows with a cocktail, Ms. Finnegan!